Xert is a training and analysis software that makes use of power data to the next level. In training and fitness analysis, training planning and fitness prediction, and real-time training and racing. Armando Mastracci, founder, and Stephen Cheung, chief sports scientist, join us to discuss how triathletes can benefit from the platform. 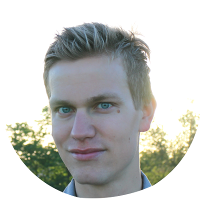 Have you found traditional formal testing at regular intervals limiting in any way? What do you think about the concept of a platform that automatically extracts your fitness from new informal, hard efforts. Who should consider signing up for Xert? One-size doesn't fit all when it comes to hydration. Take Precision Hydration's FREE sweat test and learn how you should hydrate. Use the discount code THATTRIATHLONSHOW for 15% off any products. Maximum Power Available breakthrough - Click to zoom. In this workout I did 4 x 6 minutes at 110% (roughly, it was on roads) of my Xert FTP. As you can see, my MPA (blue line) starts dropping quickly at each hard effort, but then has time to bounce back in my 6-minute recoveries. However, in my last effort, the strain is already so high that MPA drops very quickly, and I actually achieve a power number (red line) higher than MPA. This causes Xert to recalculate my fitness signature, and among other things, I get a shiny new FTP, even though this is just a normal workout. At the core of our system is our ability to model your available power. When you start to model this power, you can start to also model aspects of strain, because the amount of power you can generate is relative to how much power you have. This enabled us to model not only your intermittent fatigue and MPA (maximum power available) moment by moment, but we’re also modelling how much strain you are generating. Simply, when you perform any exercise, you weaken. As you weaken, you’re ability to generate power is reduced. We managed to identify how much your available power reduces as you fatigue. If you were to do a 5-minute effort at 400 watts, we know that at the end of the 5 minutes, if you were to try to produce 400 watts you wouldn’t be able to. So, 400 watts would be your maximal available power after 5 minutes. If you could continue to produce 400 watts, then that wouldn’t be your 5-minute power. It would be something higher than that. What we’ve done is we have been able to identify what that power is, apply it intermittently, so that we know where your power is as you’re riding your bike or as you’re running (with a running power meter). We are now able to perform all the other calculations based upon this, such as how much strain you are generating and how much overall work you are performing relative to your MPA. MPA is the foundation on which your power curve is derived and predicts how much power you can produce at any given moment in time during exercise. As an example, let’s say that MPA is pegged to the maximal power that you can generate when you’re completely fresh. Let’s say I’m just starting out and I’m completely fresh. I do an all-out sprint and my maximum wattage is 1000 watts. That will be your MPA. Then it will drain as you fatigue. For another example, let’ say you do this 400-watt effort, which is really hard, for 5 minutes. The first 30 seconds of that 5 minutes will seem to be quite easy. However, the strain on your body is worst in the last 30 seconds of that 5 minutes. What MPA will see is that you may start out with 1000 watts as your available power, but after 5 minutes of riding at 400 watts, you simply can’t generate 1000 watts because you are tired. At that point your MPA may be down to 400-600 watts. This is a very good tool especially for triathletes in terms of using MPA in real life where we can see MPA in real-time on the Garmin head units. It’s perfect for pacing in a time-trial because what you want at the end of a time-trial is that you are at the point of fatigue. Because you can see it real-time, you want that MPA to be gradually dropping throughout your time-trial. Another good use of MPA as a coach is that if you have prescribed to your athletes a certain number of intervals that you want them to be doing as hard as they can, you can see if they actually did them that hard, because if they did, the MPA will be dropping down to fatigue level. Video by Xert explaining MPA. My Xert Fitness Signature - Click to zoom. Peak Power in green, High Intensity Energy in purple, and Threshold Power in red. This is a signature typical for a time-trialist/non-draft triathlete, so maybe I should step away from this draft-legal stuff? One of the beauties of what Xert can do is it removes the need to do systematic testing like the 5-minute or 20-minute efforts to extract something like your FTP because it’s hard for a lot of individuals to find a 20-minute stretch of road on the bike where it’s safe, there’s no stop signs or anything like that. Xert can extract your fitness signature regardless of the type of effort as long as it was hard effort. It doesn't matter whether it’s an interval session or a club race. The fitness signature is the way in which we can use your power data to derive how much power you have. Your MPA gets determined when you take your power data and apply the fitness signature. There are 3 parameters to the fitness signature. You have your threshold power (FTP). You have your peak power which is where your power curve starts from. This is your highest 1-second power. Then you have what we term high-intensity energy. This is the amount of capacity that you have above your threshold. Every individual is different. Some people can hold power above threshold for a very long time. Some people can hold power above threshold for a very short time. These 3 numbers enable us to determine your power curve. More importantly, these 3 numbers are deriving MPA. When we mix your fitness signature with your power data, we can plot your MPA second by second. In the case of our analysis, if you ever surpass your MPA, that’s indicative that your fitness signature has improved. One or more of those parameters have improved. The software allows you to discover, view, and manage those improvements over time. This signature is able to model what your capability is in terms of what you can perform. That’s how we’re able to track your fitness changes on a very frequent basis. One of the things we’ve discovered is that if you look at training and power purely from a zone perspective, one thing that the zones missed is the context. You don’t really have a context for example if you’re performing a Zone 4 effort as to whether it is performed in a fatigued state or it is performed in a fresh state. You’re just accumulating all the time you spent in a particular zone. In the past, this has been very effective because it’s hard to measure the specifics that our software is measuring in terms of not only how much time you’re spending in a particular zone but under what condition are you spending that time. What we’ve been able to do is to say if you’re going to do a Zone 4 effort, what’s the context? How much power do you have at that time? If you have less power available, the system automatically determines that you have additional strain. Rather than measuring how much time is spent in zones, we measure strain second by second. We look at how much power you are generating, what is the influence of MPA on that power. We then can identify the amount of strain that you’re generating. Then we can accumulate that strain because we’ve got 3 fitness signature parameters. Because of that, we can also accumulate that strain of what we call work allocated. This means that some of that strain is applying to your threshold. Some of that strain is applying to your peak power and some of that strain is applying to your high-intensity energy. The software aggregates and accumulates all these information and presents and manages that for you. The strain and the focus are ways in which the software can identify and aggregate over the course of the workout where your strain was focused and how it can be viewed at a higher general level. A coaching mantra that we’re always told is that you need to train to the specifics of that event. The ideal is that you look at past performances or the performance that you want to have and then you build your training plan according to that. In addition to being an analytics tool, Xert is also a training tool where we can develop smart workouts that really tax those exact same systems. We can control smart trainers just like other services like TrainerRoad and Zwift. We can design these smart workouts so that they target that exact focus and the strain that you’re going to be facing in that goal race. Whether that is more of a 20-minute or 5-minute type of effort, you can go back and analyse your previous races and then design workouts that have that same metabolic strain on your body. The principle behind focus is that the work that you perform is being performed by some ratio of your 3 systems. You’re performing some of the work as your thresholds, some of the work as your high-intensity energy, and some of the work as your peak power. For example, if you do a full sprint in a fresh state where you’re over 1000 watts, that strain is being applied to your peak power. If you do those efforts over and over, your focus would be a 10-second power or 20-second power. If you’re doing efforts just above threshold for example, then that focus would be a 20-minute power or a 40-minute power. In races, you’re doing a variety of different efforts. The software accumulates the buckets that they fall into and categorizes them into a 5-minute effort for example. In other words, the ratios of the work that you did would be equivalent to what you would be experiencing during a 5-minute effort. When you do zones, you do this inherently by being specific like, this is the power you hold. But in a race, it is a very variable environment. What we’ve been able to do is to categorize what the overall training effect is of that variable effort. Then we compartmentalize and assign to the overall effort how much work is being performed against each individual system. Then we classify it so it becomes easier to understand. The purpose behind the focus is to provide a way in which you can identify, measure, and quantify how much strain is involved in a particular type of race. Example: the file above is from the bike segment of an Olympic distance draft-legal race that will be my goal race next year. The first 15 minutes or so were steady around threshold, as it was just me riding solo, but the rest of the ride I rode together with another guy, and we took turns leading, causing a much spikier power profile. As you can see, the total Focus of this race was 7:25. With this knowledge, I can now start planning my training to include workouts around that specific duration, if I expect the race to be similar next year. If you determine that your focus is a 20-minute power race for example, as you move closer and closer to the event, you would want your training efforts to be closer and closer to your 20-minute power. The idea is that you may not necessarily do all your training at a particular focus. Part of the periodization that we see is that you may start your base training and you do more endurance. But as you move closer and closer to your event, you’re going to focus your efforts more precisely on the efforts needed during that race. For example, if you have identified that this particular race is going to require a 5-minute power, then up until the peak phase of your training program you’re going to be focused on 5-minute power. You can choose a workout that has that particular target focus. There’s a number of different variables as part of your decision in terms of what training you want to perform. Whether it’s the duration or the difficulty of the workout and things like that. Typically, you will look for workouts within the particular category that you are looking for. However, if you’re designing a workout, what we’ve done within the designer is we’ve been able to identify specific mean maximal power ranges. If you say that you want to practice your 5-minute power, you can go into the designer and design an interval that says you’re going to do a 5-minute power interval. The software will then determine your specific 5-minute interval power at that moment using your given fitness signature parameters. Then it sets the power target to that power number. You can then go in and create your own workouts and the system will automatically calculate what those numbers are for you. This is again one of the beauties of our real-time ride-by-ride analysis of your fitness. These workouts are customized to your specific efforts and capacity every time. They’re updated essentially ride by ride. The fitness is constantly being updated and all of your workouts, no matter what focus you choose, is automatically updated based on your unique signatures of the threshold power, high-intensity energy, and peak power. Another one of the absolute unique things that we have is the ability to customize not just the “on” efforts of your intervals but also the recovery. There’s a difference in recovery between soft-pedaling versus still recovering at 150-200 watts. What we can do is develop workouts that are based on fatigue rather than strict time in zones. If you go harder during workouts, then your recovery is going to take longer. Whereas, if you are just coasting, then the recovery will be shorter. There’s scientific evidence that time-based recovery is not as optimal compared to heart-rate based recovery. Xert takes this to the next level. This allows that customization of a coach being able to design a workout based on fatigue during the “on” efforts and also during recovery. This is a combination of a lot of things that we’ve been up to where we introduced The Fitness Planner. We called it The Fitness Planner because you can use it to plan out what your fitness numbers are going to be and plan those out into the future. What made this happen are two things. The first thing that the system is able to do is to give you a higher frequency in terms of assessments of your fitness rather than having to test every month or two months or sometimes even never. People just don’t like to test. So, you really don’t have any perspective of where you are from a fitness standpoint. What we’ve been able to do is determine what your fitness is on a weekly, bi-weekly, sometimes even multiple times per week basis. We’re getting a track on what your fitness is. This creates a lot of rich information that is telling us where you’re numbers are at any given moment in time. We take this information and map it to your training loads. Because we’re now measuring training load across different systems, one for each fitness signature parameter, what turns out is that when we look at training loads across these three systems, training loads are linearly correlated to your actual fitness numbers for each system. When we calculate your lower training loads – your training load that’s being applied to your threshold power – the overall training load that you have accumulated is linear to your actual threshold power. What that means is that if we know what your relationship is - and the software does this for you under the covers - it determines the relationship between training load and your threshold, as an example. 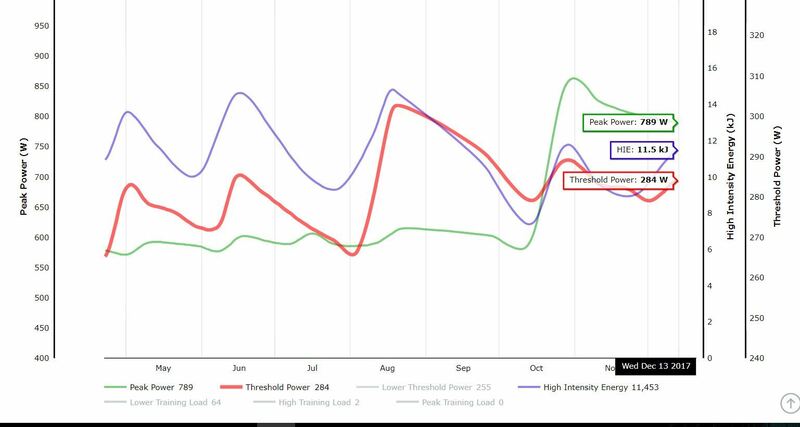 When you then say that you’re going to do all of this training and this equates to so much training against your threshold power, it then says we expect your threshold power to go up by 5 watts as a result of that training. It’s all based upon your data and the fitness signatures that you’ve expressed in your data over time. That’s the foundation of all of the math behind how we determine these. Then in The Fitness Planner as well as now in The Training Advisor, we’re able then to project out and say, if you do this training, this is where we expect your numbers to be. The Fitness Planner allows you to do-it-yourself. You can map out your own training program. The Training Advisor on the other hand does some calculations and tells you recommendations at any given moment in time. It looks back at your previous training, efforts, and training loads. Based on this, this is where we think you should be training on a given date. The Training Advisor is exciting in a sense that it’s going to be fully adaptive. When you wake up in the morning, it’s going to look back and check your current freshness level, your current training load, your current tolerance for fitness, your current focus, and it accumulates all these information based upon that and then says, here are 4 workouts that you should be doing today. Also, one of the neat things that you can do with The Fitness Planner is experiment either as a self-coached athlete or as a coach with your fitness and try different things. What would happen if I did 5 hard efforts a week instead of 2 hard efforts? How would that impact my fitness and fatigue levels in the next following weeks? You can experiment a lot with different training ideas. What if I did a lot of this particular type of effort and focus my training that way? How is that going to impact my fitness in all 3 signature levels? It allows you to predict ahead of time what your fitness and fatigue is going to be without necessarily having to actually do a trial and error trying all these different efforts which might take you years to accumulate that knowledge. You can really try and model your own fitness without necessarily having to do them. Then based on that, choose the best program for you or your athletes that you’re coaching. The Training Advisor also takes into account some input parameters like when your target race is, what it is, and what kind of athlete you want to be, whether you want to be a time-trialist or a sprinter, etc. It tailors it to those goals as well as some improvement rates, whether you want to be more on a maintenance mode or you want to have an aggressive improvement rate. It’s not just the input from the training that you do, but also some boundary constraints around it. The Training Advisor is really useful for a lot of athletes who wants to know what to do. It may not be the absolute, optimal training that a coach can really adapt day to day and tweak to a super fine level. However, it will get you there 90-95% to an optimal training path. For a lot of self-coached athletes, it will give you a starting template of what to do. This will give you what the model suggests – a near optimal plan that you can still tweak as you wish. 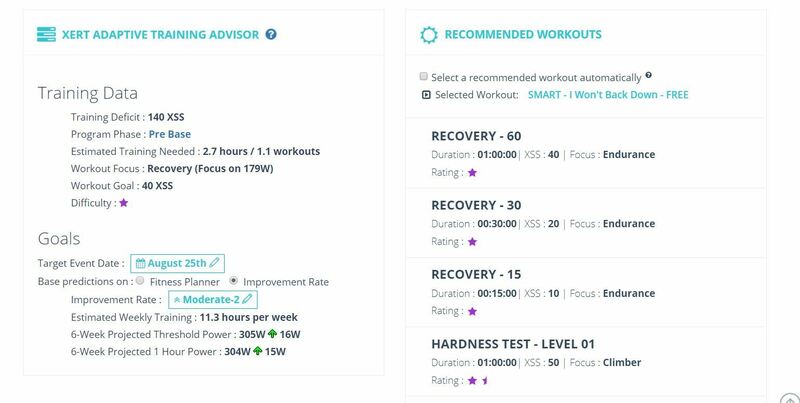 What’s been really interesting in the development of The Training Advisor is that a lot of best practices that you see great coaches provide for their athletes are coming out naturally from the engine itself. We didn’t create the training models in the software. We just recreated the rules by which we felt that people would be training by and how, when, and where they would be able to perform various efforts based on their freshness levels. As a result, all of these things came out automatically. The Training Advisor is certainly not meant to replace coaches. It’s really meant as a boon for coaches to validate if what they are suggesting is the best path for their athletes. It allows that confidence for coaches to see that it matches their athlete and they can start tweaking it and optimizing it from there. In the short-term, we’re likely going to see things like longer-term recovery and long-term fatigue. What that means is that over the course of a long event, you’re going to see a degradation of your fitness signature. What you can perform at the start of an event is very different to what you’re going to perform at the end of an event. We have that model in place. We have a way in which we can determine how your signature parameters are affected over a long race. We simply need to be able to implement these into the software. This is going to be really good for people who are in longer events like triathletes who are looking to model how they’re fatigue level is being influenced by these longer races. In the long-term, our heritage is really in heart rate. We’re starting to invest in some new heart rate models and modeling. We feel that we can extend what we have done in terms of modeling, training, and improvements and apply these to just pure heart rate data. When we can do that, then we can extend all these best practices to other sports outside of cycling and running. Anyone who is going to be training over the winter whether they are using a smart trainer of if they have a power meter on their bike should be considering our software to get an idea in terms of how they are progressing. Using The Training Advisor over the course of the winter would be very effective. You can use it to, for example, if you’re planning on doing a Zwift race. Rather than just riding without any goal in mind, The Training Advisor will be able to give you specific goals that you should be looking to achieve on a day to day basis whether those are structured or unstructured workouts. Over the summer, continue to use the software on your Garmins in tracking your fitness on a day to day basis. The cost is $9.99 on a monthly basis or $99.99 on a yearly basis.